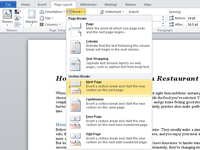 1Move the insertion pointer to the start of your document. The Ctrl+Home key combination moves you there instantly. 2Type and format your document’s title. It can be on a single line or on several lines. 3To center the title right to left, select it and press Ctrl+E. That combo is the Center keyboard shortcut. 4Position the insertion pointer after the title's last line, and then, on the Page Layout tab, choose Breaks→Next Page from the Page Setup area. 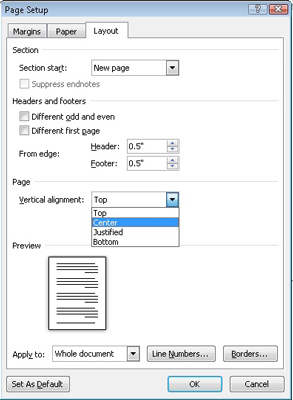 The section break after the title’s last line ensures that only the first page of your document is centered top to bottom. 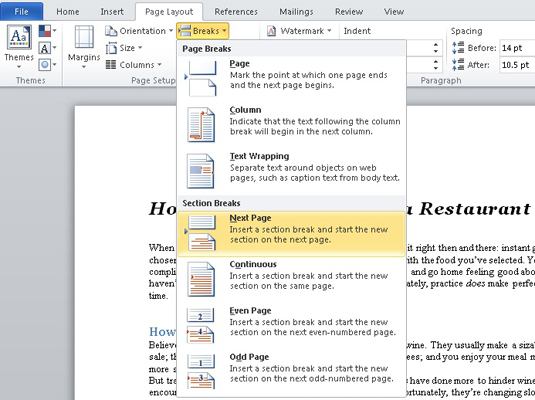 5Ensure that the insertion pointer is once again on the document’s first page. You need to be on the page you want to format. 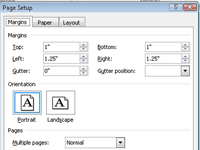 6Click the Page Layout tab and click the dialog box launcher in the lower-right corner of the Page Setup area. 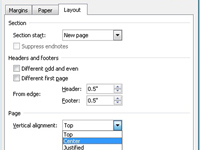 7Click the Layout tab and select Center from the Vertical Alignment drop-down list. You can find this item in the bottom half of the dialog box. 8Confirm that the Apply To drop-down list shows This Section, and then click OK. 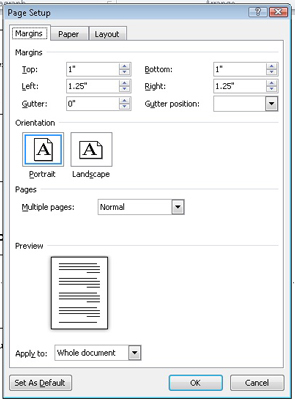 Your changes are easy to see when you use Print Layout view. The first page of the document will be centered, top to bottom.